When the year has had some of the best animation in recent years, you have a lot to live up to. 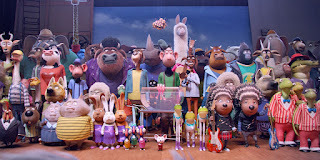 Sing definitely ends the year of animation as the nail that pops the tire of the animation car travelling fast from earlier this year. Let’s get reel and break this down. The environment that the animals inhabitant does match the accuracy of daily life of us mortal humans. The songs are about as catchy as a five-year-old playing catch with their parent…so hit and miss. The theme is nice for kids on never giving up on your dreams but it doesn’t go beyond that. The story is non-existent and it’s a cheap marketing ploy to make you watch America’s Got Talent, The Voice, or The Other Singing Competition Show. That last one doesn’t exist but I want to create a primetime parody show called that. The characters are lifeless or extremely one-dimensional but that’s ok kids the next song is around the corner!!! With Zootopia (you knew I was going to bring it up) it was adult and tackled serious conversations while being friendly, colorful, and clever with humor. Sing does none of this. I know it’s a different movie, but when you have the same type of environments take advantage of it instead of making it simple to appeal just to toddlers. Lastly, I didn’t feel like I knew any of the characters beyond this competition and there were also side stories and characters that felt like different movies and didn’t mesh well. Everyone is fine, I guess. Some of the lines garnered a chuckle here and there from Seth MacFarlane. The environments and some animals look great and capture the grounded reality of the real world. With the above statement, they also don’t try anything new so most shots are very bland or standard. At an hour and a half it’s painless? Since the story is so empty, at parts it does feel longer than a usual animated film. As an adult taking your sibling, kid, or going by yourself, you can find some visual eye candy appealing but it is masked with a lifeless movie considering how animated the characters are sometimes and a big advertisement for America’s Got Talent and nothing more. Note: They actually did play an advertisement for an America’s Got Talent Christmas Special before the movie…so you know…that says a lot.